In the last decades, an active and stimulating area of research has been devoted to explore the role of neuroactive steroids in pain modulation. Despite challenges, these studies have clearly contributed to unravel the multiple and complex actions and potential mechanisms underlying steroid effects in several experimental conditions that mimic human chronic pain states. Based on the available data, this review focuses mainly on progesterone and its reduced derivative allopregnanolone (also called 3α,5α-tetrahydroprogesterone) which have been shown to prevent or even reverse the complex maladaptive changes and pain behaviors that arise in the nervous system after injury or disease. 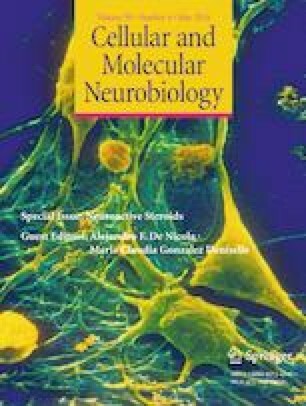 Because the characterization of new related molecules with improved specificity and enhanced pharmacological profiles may represent a crucial step to develop more efficient steroid-based therapies, we have also discussed the potential of novel synthetic analogs of allopregnanolone as valuable molecules for the treatment of neuropathic pain. This work was supported by Grants from Consejo Nacional de Investigaciones Científicas y Tecnológicas (PIP 112 20150100266), Fundación René Barón and Fundación Williams, Université de Strasbourg, Institut National de la Santé et de la Recherche Médicale, and Association Ti’toine de Normandie. These funding institutions/organizations had no role in the collection, analysis, and interpretation of data, in writing the report, and in the decision to submit the article for publication. S.L.G and A.G.M-N conceived, designed, and wrote the manuscript. L.M., M.C.R., and C.P-M designed the figures. L.M., M.C.R., O.T., M.F.C., and C.P-M revised and critically contributed to the approved final version.